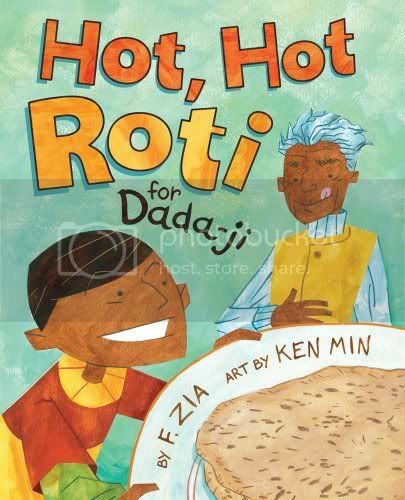 When Aneel hears that his grandfather, Dada-ji, used to wrestle buffalo, tie cobras together and practically juggle elephants with the help of the roti bread that gave Dada-ji the strength of a tiger, he decides to cook up a huge batch himself. Thinner than naan, thicker than crispy papadum or chapati, roti is an unleavened flatbread made with just the barest hint of butter and salt, in many ways pretty similar to a tortilla. I must admit, I haven't thought much about this staple of my diet... I'll usually have roti in a wrap, and I'm thinking more about the filling, be it aloo gobi or some other curry. At first, Aneel's roti turn out uneven and a bit lumpy, one even looks kind of like a map of America, but with some practice, they turn out round and perfect. Acrylic and colored pencil illustrations with razor sharp edges almost look like collage. There's some great variety in the layout of the brightly colored full-bleed pages... some of them are comic book style and there are a few two-page spreads. Min does a fantastic job of getting grandfather's rascally personality across in his facial expressions, both as a young man in India, and as a grandfather in present day. I liked the symmetry as the grandfather's exploits: making the earth shake (a boy pulling a plow in a field is pictured), shaking the giant mango tree, and touching the sky with his feet (he climbs a palm tree, much to the consternation of the village) are echoed by his American grandson who stomps in the yard, shakes apples from a tree, and touches his feet to the sky on his swingset. Make no mistake, this is a lengthy picture book, meant for older children. Still, the repeating refrain of the villagers, "Arre wah! Wah! Wah!" at Dada-ji's feats of skill makes for a fun read-aloud refrain.